Yes, after Chicago and CL birthday celebrations and Charlottesville and New York, it is true that my body could use a few more vegetables and a few less excuses to celebrate…well anything. And I think my bank account might be thankful for the cutback too. 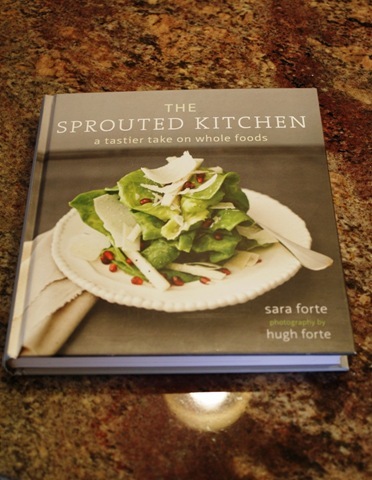 Luckily I’ve been gifted a beaUtiful cookbook from our dear friend Kate, full of delightfully tempting recipes that focus on whole, healthy foods (yes). And so much color! Which is something we can all benefit from a little more of in this seemingly endless grey, grey winter. First day of spring Mother Nature? I would like to see some evidence of that. In any case, my first attempt from this gorgeous recipe collection was absolutely delish. So if a few weeks of behaving means cooking and dining on dishes like this, then I’m sure it won’t be so hard at all. Preheat oven to 400 F. Put polenta in a medium saucepan with milk, water and a generous pinch of salt. Bring to a boil over medium-high heat, then reduce to a simmer. Cover and cook, stirring occasionally until creamy: 15-20 minutes. Add nutmeg, thyme, cheeses, salt and pepper to taste and stir to combine. Cook for a few minutes longer, then turn off heat and leave lid ajar. In a large bowl, stir together oil, vinegar, herbes de Provence and a pinch of salt. Brush both sides of the mushrooms with the dressing and toss the kale with remaining dressing. Place mushrooms on a baking sheet, stem side up. Bake mushrooms for 10 minutes. Remove baking sheet from oven and spread kale over remaining space. Sprinkle with red pepper flakes and roast until kale begins to wilt, about 5 minutes more. To serve, place a scoop of creamy polenta on each plate. 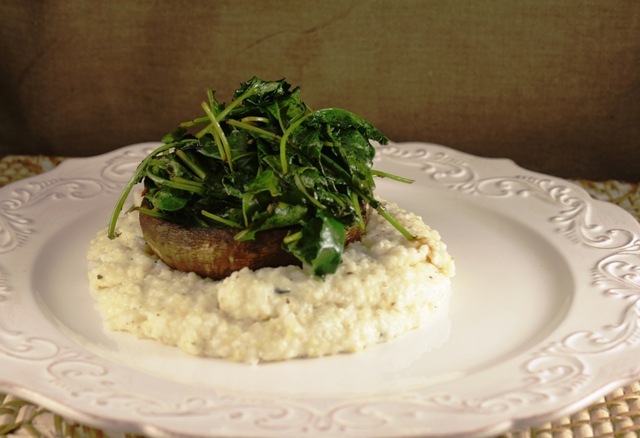 Top with a roasted portabella and finish with wilted kale. Eat and feel healthy. Resist the urge to pour a glass of wine ;).